Originally penned and posted in January 2011. The weekend before His Passion, Jesus went and stayed with His friend Lazarus (whom He had raised from the dead) and Lazarus’ sisters Martha and Mary. 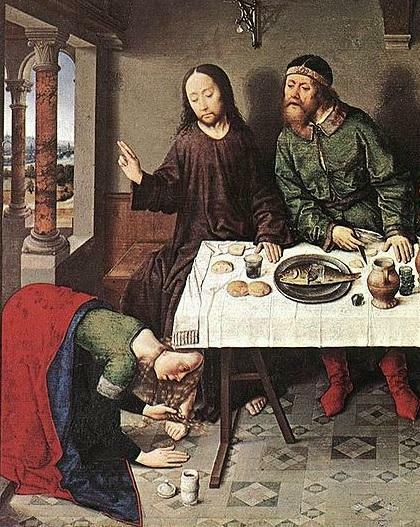 Mary brought out a very expensive flask of ointment for the dead and applied it to Jesus’ feet with her hair. The whole house was filled with the sweet smell of that ointment. And guess who gets all mouthy about this? Yep. Judas Iscariot – who already was planning to sell out Jesus, and had been planning on cashing in on Him since the miracle of the loaves and fishes a few days earlier. Specifically, when Jesus told the people that they must eat His Flesh and drink His Blood, and kept repeating it over and over and over again to be sure that everyone understood that He meant it literally, Judas (with urging from satan) decided that Our Lord was nuts and started planning to betray Him and profit from it. That whole episode is in John chapter 6. Read it. Back to Lazarus’ house in John 12. Judas gets all holier-than-thou and complains that the flask of ointment could have been sold for 300 pence and “given to the poor”. Does this not sound like the godless Marxist liberals of today who are so quick to tell everyone else what they should be doing with their money and assets, all in the name of the poor, of course? Um, hello? The Holy Spirit is talking to us. Are we listening? That verse should make the hair on your arms stand up. Is this not a PERFECT mapping to our contemporary situation? You have a “disciple” who doesn’t really believe in Jesus or what He says – he just pretends to because he thinks he can gain power and wealth by associating with Jesus for now. He’s just working the “Jesus angle”. But everything he is doing behind the scenes is working in direct opposition to Our Lord. Now, this “disciple” starts trying to appear pious and devout by pontificating that all wealth and resources should, by definition, be redistributed to “the poor”. But in truth, he is just a thief. Dude. Can this be any more obvious? It is hers to do with as she (and her family) sees fit, and they have seen fit to use it to anoint their beloved Jesus. Judas, sit down and shut your proto-Marxist piehole. THWAP! This entry was posted in Uncategorized on January 31, ARSH 2013 by Ann Barnhardt. Absolutely not. What He is explaining is that in all free societies wealth will always exist within a SPECTRUM. Let’s compare a “poor” person in the U.S. to a “poor” person in Bangladesh. A poor person in Bangladesh lives in the gutter without so much as a cardboard shelter to sleep under. They are sick from malnutrition and starvation. They probably dress in rags, and certainly do not own a pair of shoes. Bathing only occurs when they can immerse themselves in a river, which is opaque with sewage. They own nothing except the rags that they wear. Every day is a struggle to get a bit of clean water and enough food to merely survive. That’s a poor person in Bangladesh. What constitutes a “poor” person in the U.S.? A poor person in the U.S. does not have cable. A poor person in the U.S. does not have broadband internet access, and may not even own a PC. A poor person in the U.S. may have just within the last year or two finally switched from a cathode ray tube television to a flat screen, digital model. A poor person in the U.S. receives food stamps, medicaid and a welfare check. A poor person in the U.S. is probably overweight. A poor person in the U.S. drives a car that is so old that it came with a factory cassette player. A poor person in the U.S. lives either in a trailer or a HUD apartment complex. A poor person in the U.S. probably DOES have a cell phone. Understand that on a percentage level, these two descriptions are equivalent. A “poor” person in the U.S. has a standard of living that would be considered luxurious in Bangladesh and other impoverished countries. The notions of “wealth” and “poverty”, by logical and mathematical definition, exist within a SPECTRUM. And no matter what we do, that spectrum will always, always exist. That is what Jesus is saying. There will always be a top-end, and there will always be a bottom-end. In some nations (like Bangladesh), that spectrum is very broad and reaches very far down into poverty, indeed. There are billionaires in Bangladesh, and there are people starving in the gutters in rags. In the U.S., we certainly have a wealth spectrum, but the low end is much higher and the spectrum is much narrower. We have many billionaires, but our lower-end is nowhere NEAR as low as Bangladesh’s. The point is, no matter how much you bring up the bottom-end, there will ALWAYS, by mathematical definition, BE a bottom-end. If the bottom-end was a $100,000 per year household income and a $300,000 home in today’s dollars, then a household with a $100,000 income and a $300,000 home would be considered “poor”, called “poor”, and Marxists would tell those “poor” that they were being “oppressed” and “deserved” and were “entitled to” a $500,000 annual household income and an $800,000 home. DO YOU UNDERSTAND? Someone is always going to have more money and assets than somebody else. It is impossible to have a free society wherein every person has exactly the same level of wealth. Someone has to be the business OWNER, and someone has to be the EMPLOYEE. Someone has to be the wage PAYER and someone has to be the wage EARNER. If everyone in a culture was economically equal at all times, there would be zero employment because no one would work for anyone except themselves. You can’t have a company with 10,000 CEOs. Conversely, you can’t have a company that is nothing but entry-level laborers. Someone has to be responsible. Someone has to sign the paychecks. Someone has to determine the course of the business. Someone has to risk their assets and wealth to start-up the company in the first place. And, at the other end, someone has to scrub the toilets. The only way to get true, complete equality of wealth would be to kill EVERYBODY. What then should the objective be? I think that the former-U.S. and other free-market capitalist societies were the closest humanity has ever been to the ideal, and though imperfect, are certainly pointed in the right direction. The ideal is a healthy wealth spectrum that is always moving higher through growth and moral technological advancements and innovations, is open-ended on the top side, but has an intrinsic morality such that the top-end of the wealth spectrum always makes certain that the bottom end advances apace and that the spectrum maintains its proportional width – or even narrows a bit. This is achieved through personal charity AND through a moral, lawful society that allows for movement both up AND down the spectrum. The top-end cooperates with the bottom end to enable upward mobility for those who work hard, and are innovative. Conversely, if someone on the top-end does not work hard or is dishonest in his dealings, he can and will fail and slide back down the spectrum. This freedom of movement within the spectrum – both up AND down – is essential. Trapping people on the low-end (ahem, cough, WELFARE STATE, CLOWARD-PIVEN STRATEGY, OBAMA REGIME, cough) is equally as immoral as the disgusting patrician upper-classes who think themselves immune from morality, the rule of law or personal responsibility (ahem, cough, OBAMA REGIME AND ENTIRE POLITICAL CLASS, cough, cough). So, there you go. Economics as explained by our Blessed Lord in five little words while He was hanging out at His friends’ house having supper the weekend before He died. And proof that Judas Iscariot was the intellectual father of Marxism and of scumbag politicians in general.  Our Father, who art in heaven, hallowed be thy Name. Thy kingdom come. THY WILL BE DONE, on earth as it is in heaven. Give us this day our daily bread. And FORGIVE US OUR TRESPASSES, as we forgive those who trespass against us. And lead us not into temptation, but DELIVER US FROM EVIL. Oh my goodness! Look at that horrible man swinging that ASSAULT WEAPON like some sort of a masculine, manful manly man, or something. I’m scared! HOLD ME!!! Oh, wait. That’s St. Artemius. He was a commander in the Imperial Army under Emperor Julian the Apostate in the mid-4th century. When Julian condemned two priests, Eugene and Macarius to torture and death, Artemius SPOKE UP AND CALLED BEE-ESS, KNOWING THAT IT MEANT HIS OWN TORTURE AND DEATH. Sound familiar? Do you see why I post these mini-bios? These are the people who did what millions upon millions of YOU should be doing – standing up and calling bee-ess on a tyrant and antichrist, even though it means certain destruction, imprisonment and maybe even death, eventually. I post these in part to SHAME all of you. Shame on you. Shame on your cowardice and faithlessness. Shame on your worshiping of your true god: your precious, precious crap. Do not have illusions – O Emperor! – in following your love of Satan, do not persecute the Christians protected by God. The power of Christ is invincible. Julian instantly had Artemius arrested, tortured in an attempt to get him to apostatize (which FAILED MISERABLY), and then finally after giving up, had Artemius beheaded. You people do realize that the Obama regime is doing the same thing – they are using the coercive power of the government, specifically through the IRS, to get as many of you as possible to apostatize – and MAKE NO MISTAKE, capitulating to the regime, the HHS mandate and paying taxes which you know for a metaphysical certitude are going to pay for abortions and advance sodomite “marriage” under the law, not to mention reforming and arming the islamic caliphate, is apostasy from Christ. Spare me your emails pleading for your property. I’m liquidating mine as we speak. I’m really not interested in your, “But, but, but I can’t lose my house” whining. This time next year, if war hasn’t broken out and I’m still alive, I’ll probably be living in a van down by the river. And if it comes to it, I’ll happily go to my imprisonment and execution and be grateful for the blessing. Hell is forever. FOREVER. There is exactly one thing that is impossible, and that is for you to cease to exist. You will always exist. Forever. And ever. One hundred billion trillion years will be the “warm up”. The question is, where will your existence be? Will it be inside the Trinity pondering the Beatific Vision, or will it be in hell? Ask yourself if your house is worth eternity in hell. Seriously. Oh, and Julian eventually got greased himself, and his dying words were, “Vicisti, Galilaee.” You have won, Galilean. St. Artemius, pray for us. This entry was posted in Uncategorized on January 29, ARSH 2013 by Ann Barnhardt. 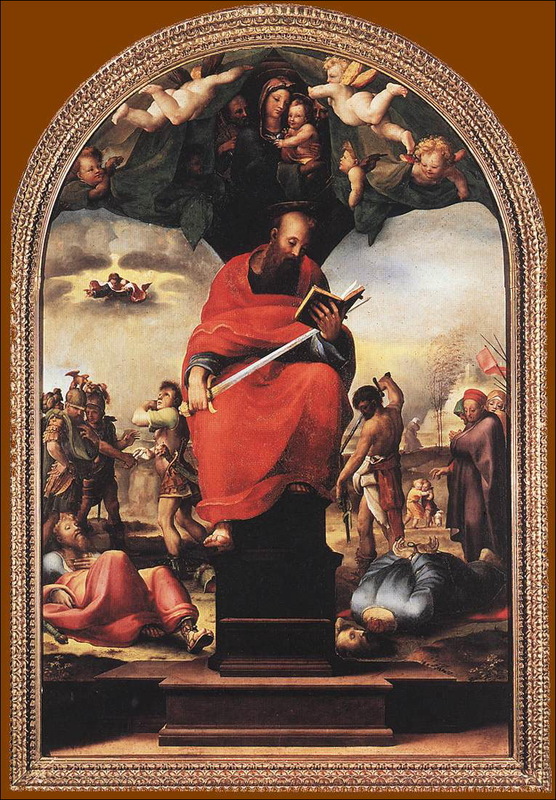 Back to an image of St. Paul sent in by a reader, this one being by the Sienese Mannerist Beccafumi. On the left is Saul (soon to be renamed Paul by Our Lord) after being knocked off his horse on the Road to Damascus at the moment of his conversion. On the right is a graphic representation of Paul’s beheading. We need to see these things. That’s what really happened. One second there was Paul, the next second his head was laying in front of his bleeding-out neck stump. True, true. But I still think we’re missing the point. In the center is a wonderful Paul, head firmly restored to body, as he sits and reads scripture while holding the same ASSAULT WEAPON that beheaded him, easily yet manfully across his lap and resting on his forearm. The reason martyr saints are depicted holding the instrument of their execution is because it is just so totally macho. It is the ultimate comeback. Dare I use the term, it is a bit of visual trash-talking, except the holy, sanctified kind. Now map this onto today. Eventually someone in the U.S. is going to get shot by the government for being a Christian. Let’s say that the person is shot with one of the 7000 AR-15s that Janet Napolitano just ordered. How should the dead person be pictured in iconography thence forward? They should be pictured just like St. Paul – manfully holding an AR-15, even if they never fired an AR in combat themselves. It is the ultimate jab at the tyrants – cut me down and it only makes me stronger, and I will embrace your own weaponry and wave it back in your face, sanctified. And then WATCH WHAT HAPPENS. This entry was posted in Uncategorized on January 28, ARSH 2013 by Ann Barnhardt. One Simple Question: 5.56 or 7.62? This entry was posted in Uncategorized on January 25, ARSH 2013 by Ann Barnhardt. I get a steady stream of these types of emails, but I think the pace has picked up a bit lately. I post this so that all of the financial professionals of conscience out there can know that they are not crazy and they are not alone. Guys, it’s time to call it. I want you to go through the mental exercise I went through in early November of 2011. Pull up your equity run. Go through account by account. Think about the people therein listed, and their money that is with you. Then imagine having to call every one of those people and tell them that their money is gone. All of it. Up in smoke. I suspect that the Apple crash has something to do with this uptick in “I’m done” emails, as it appears that most of the guys I’m hearing from are on the equities side. Whatever. Whatever it takes to make you realize that it is absolutely morally incumbent upon YOU to do everything you can to protect whatever monies your clients have with you. Don’t think for one second that Christ Almighty doesn’t know and understand the term “fiduciary duty” and won’t hesitate to drop it on you at your Particular Judgment. I’m a Catholic, a gun owner, a southerner, a family man, I’m also a financial advisor. I see where this is headed. I’m in the process of an exit strategy of the business. I can no longer represent a system that is rigged. I see these gutless masters-of-their-universe peers who are so far from a state of reality, I just can’t do it anymore. I’m going to advise my clients to get out because I’m getting out. As you know, the money is good, but if I continue, I’m part of the problem. I don’t know what I’ll do, but I’ll figure it out. Wow. Look at this Russian statue of a saint holding a massive, enormous ASSAULT WEAPON. Goodness. Look at that thing! That could put someone’s eye out! What if children saw this statue? Young boys could be turned into masculine wanna-be soldier nightmares, or something. Who is this person, wielding this ASSAULT WEAPON and scandalizing children? 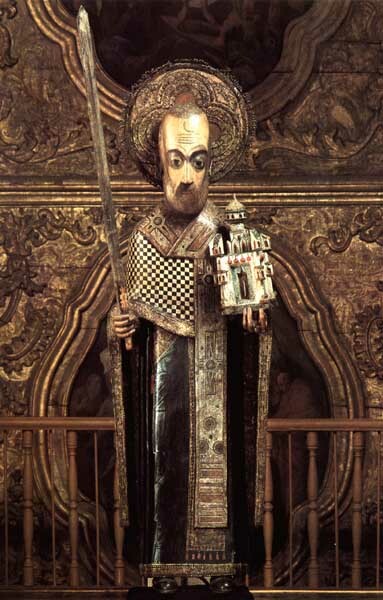 This is St. Nicholas Mozhaisky, who is the same person as St. Nicholas of Myra that punched the heretic Arius right in the piehole at the Council of Nicea, that we all know and love today under his Dutch moniker, Santa Claus. In the 14th century, the city of Mozhaisk, Russia, which is just west of Moscow, was being invaded and besieged by a Mongol-Tartar army. The invading army was massive and the locals were outnumbered. The situation was all but hopeless. So, the people turned to prayer, begging God for a miracle, because a miracle was their only hope. God answered them. 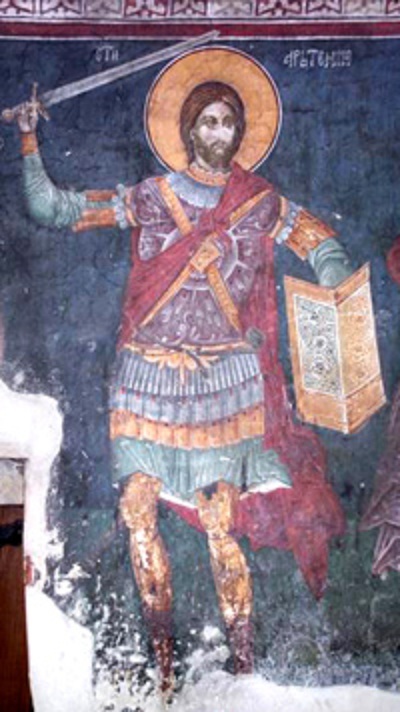 St. Nicholas appeared as a massive vision in the sky holding an ENORMOUS, GLISTENING ASSAULT WEAPON in his right hand, and the city in his left – which is shown in the statue above. Upon seeing Santa Claus above them manfully wielding his GINORMOUS, HUGANTIC ASSAULT WEAPON, the Mongol-Tartar army who had been guaranteed a total victory by their size and tactical dominance of the city of Mozhaisk, dropped everything, turned around and ran away as fast as their little Mongolian feets could carry them. Mozhaisk was saved. As the world around us descends into ugliness and lies, we must not descend with it. There will always be beauty no matter what happens, because beauty is a constitutive quality of God Himself. Beauty cannot be totally eliminated from the world any more than God can be eliminated from the world. This is the vocal ensemble Chanticleer singing the Welsh lullaby Suo Gan. This entry was posted in Uncategorized on January 24, ARSH 2013 by Ann Barnhardt. Several days into the battle, our old friend, St. Michael the Archangel appeared to Mercurius and gave him a sword (which is an ASSAULT WEAPON) and told him to go manfully kill Berbers with it. St. Michael guaranteed Mercurius victory, but also told him that he would eventually suffer and be martyred for Christ. Your Majesty, the victory was not due to dumb idols made by human hands. It was accomplished by the grace of our Lord and Savior, Jesus Christ, who sent His archangel to give me a sword and strengthened me. I cannot deny my God and worship statues. Decius ordered Mercurius arrested, had him tortured multiple different ways, always trying to elicit a denial of Christ, but Mercurius being the stone-cold man that he was bore all of his tortures in silence – to a miraculous degree. Finally Decius had him beheaded on December 4, AD 250. Mercurius’ final act was to beg God’s forgiveness for his persecutors and executioners. Mercurius was 25 years old. Oh, by the way, the Berbers are the people of Western Egypt, Libya, Algeria, Tunisia, Morocco, Mali and Mauritania. St. Mercurius, pray for us.